Handicap equipment, handicap scooters, scooter lifts, All-Terrain vehicles, and wheelchairs and walkers - We have all you'll need in the way of handicap and disabled fitness equipment, mobility equipment, and accessories. We have modular and portable ramps, scooter ramps, wheelchair batteries, scooter batteries, and handicapped exercise equipment that allows you to have accessible home gym equipment, so you can stay fit in total convenience! 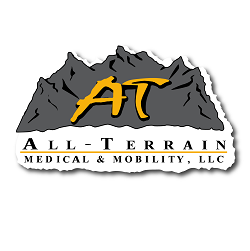 Why get your handicap equipment from All-Terrain Medical? Exercise your right to live a freer life, with handicap equipment that includes wheelchairs and walkers, handicap scooters, scooter lifts, portable ramps, scooter ramps, shower chairs, wheelchair battery replacement, scooter battery replacement, for less and delivered straight to your door! Our handicapped and disabled equipment comes direct to you from the company with a heart. Discount handicap equipment, handicap scooters, scooter lifts, All-Terrain vehicles, and wheelchairs and walkers - We have all you'll need in the way of handicap and disabled fitness equipment, mobility equipment, and accessories to get you moving. We have modular and portable ramps, scooter ramps, wheelchair battery replacement, and handicapped exercise equipment that allows you to have accessible home gym equipment, so you can stay fit in total convenience!